When you live in Phoenix, an operational air conditioner is more than a comfort; it’s a downright necessity. If your AC stops working, the temperature is going to rise and the harsh heat will start to encroach on your home. Most issues with an air conditioner come down to around ten causes. Use this list as a way to check your system, and if you need a repair, cleaning or replacement, call us at Integrity AC and Heating. Our HVAC experts want to help you keep your cool. 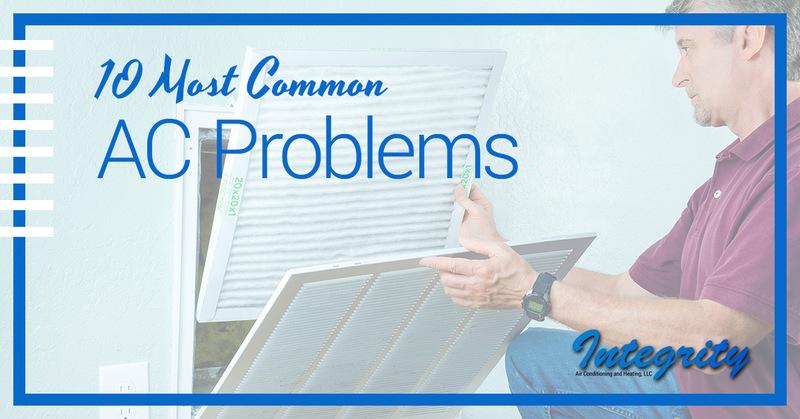 Possibly the most common cause of trouble for an air conditioner is also one of the easiest to fix. If your filter is clogged or dirty, it can prevent proper airflow through your AC unit. Check the instructions that came with your air conditioner to review the recommended process for replacing the air filter and how often it should be replaced. Depending on the model and manufacturer, it could be monthly, while some are every three months, and others are reusable and should be cleaned when they get dirty. A good way to check if your filter needs to be cleaned is if you can see light passing through it. A dirty filter can not only prohibit the flow of air, but it can also cause the AC unit to freeze and put undue strain on the system, causing it to break down faster. Another quick fix to mark off the list is to ensure your thermostat is operational, the inside of it is clean, it is level, it is not being affected by direct sunlight, and it is on the right setting. If, after that, the problem continues, there may be another issue. Many older thermostats have problems with their dials getting loose, severely impeding their ability to accurately and effectively control the temperature within the home. This issue can get a bit more dangerous, so it’s important to exercise caution if you think there may be a leak. If coolant begins to leak within the air conditioner, it will not perform correctly and temperature fluctuations will become a common occurrence. Where the leak takes place within the unit will determine the repairs necessary to fix it, so we recommend you have a qualified HVAC specialist inspect the unit and diagnose it properly. A yearly HVAC checkup is also recommended to catch problems before they get worse. Just like filters, an air conditioner’s drain line can become clogged with dust, dirt, and lint. When the drain line is clogged, the drain pan will fill up, and water will leak out of the unit. This can cause damage to the air conditioner and surrounding area. An air conditioner has breakers and fuses intended to protect the motor and compressor from overheating. If the unit’s motor breaks down, one of the first things an HVAC specialist will check is whether the breaker and fuses are still operational or not. The AC unit has two types of capacitors, and both are vital to its proper operation. The first is the start capacitor, which is what activates the motor to run. The second is the run capacitor, which continues to send a series of electrical jolts to keep the motor running. If either of the capacitors burn out, the AC unit will not run efficiently, if at all. The compressor is one of the most important parts of an operational air conditioner. It applies energy to the refrigerant and propels it through the coils to handle the heat exchange. Without a working compressor, your AC unit will not be able to cool your home. If your unit has run out of refrigerant, either through use or a leak, the compressor will overheat and seize up. However, if there is too much refrigerant, it will be returned to the compressor and cause it to fail. The evaporator coils are the portions of the air conditioner that absorb the heat in the air and send it back into the home as cool air through the home’s air ducts. If the evaporator coils become corroded, this process will be impeded. As these coils are contained within the unit, they typically only need to be inspected for maintenance every three years. The condenser coils are located outside of the unit with the compressor, which means they can get dirty due to outdoor elements, like the weather. They are the portion of the unit which takes the heat that has been absorbed from within the home and expels it gradually over time. Thanks to their location outside of the unit, they can usually be cleaned easily with your outdoor garden hose. However, if they get too dirty, they will need to be cleaned with a chemical cleaner by an HVAC professional. An air conditioner contains contractors for the compressor, blower motor, and condenser fan motor. Their purpose is to facilitate the electrical connection that starts and runs the motors and compressor. If the contractor has arcing and pitting, it will have more difficulty transferring the electrical current to the motors. Hopefully, these tips will give you an idea of what could be giving your air conditioner trouble. If you need professional assistance, routine maintenance, cleaning or repair, call Integrity AC and Heating today. Our HVAC specialists have years of experience and will make sure your home is comfortable in the treacherous Phoenix heat, all year round.